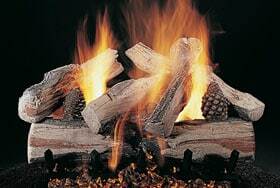 Enter Your Fireplace MeasurementsAll fields are required unless otherwise noted.All measurements are in inches. Refine Your MatchesSome options are not always available. Vent Type: What is 'Vent Type'? Log Width Range: What is 'Log Width Range'? Fireplace Type: What is 'Fireplace Type'? Quick Ship: What is 'Quick Ship'? The soft, muted color is less likely to show dirt and soot, compared to other pure white birch sets.